The Sheriff’s Chaplaincy Unit supports and complements the duties and services of the Newton County Sheriff’s Office. While maintaining the high standards and ideals of the Sheriff’s Office, chaplains perform their services in a professional, humble manner, as they express empathy, dignity, and respect for all people and beliefs. Sheriff’s Chaplains come from a wide variety of faith groups and backgrounds. They are clergy volunteers who are ordained, licensed, or approved members of different religious organizations. Although they serve in a secular setting, chaplains have the ability to provide spiritual guidance, and religious rites and practices when requested. All Sheriff’s Chaplains have completed Basic Chaplain Academy Training, and are approved through The Georgia Sheriffs’ Association Chaplain Division. The sponsoring agency conducts personal background investigations. Chaplains attend continuing education classes and are equipped to deal with physical trauma and emotional crisis care. 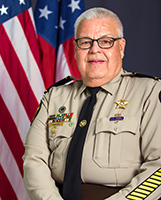 Sheriff’s Chaplains are available to deputies, detention officers, their families, Sheriff’s Office staff and personnel, the community, and schools for emergency or on-scene calls on an around-the-clock basis. Chaplains perform funerals and support family members with aftercare, assist with and provide death notifications, and offer immediate and extended grief counseling. Chaplains initiate crisis care at emergency scenes for citizens, and professional rescuers, and provide critical incident stress debriefings. They will visit the ill or injured in hospitals or private homes, offer invocations, prayers, or benedictions at special events and ceremonies, and perform marriages for Sheriff’s Office personnel, family, and friends. Chaplains serve as liaisons with other clergy in the community and are often guest speakers at events. Chaplains meet with community leaders, clubs, service organizations, and with advocates for the needy, displaced, and homeless to insure quality of life for all. Their goal is to discover community service needs. Chaplains attend Duty Watch briefings, and ride along with deputies on patrol as they take calls for service.